Jim is a Baltimore native and a 1972 University of Baltimore graduate with a degree in marketing and a degree in Finance. Jim spent 25 years in the packaging industry, selling for the largest food metal and specialty company in the world. While there, he progressed to regional sales manager for the Northeast. With changes in the global economy, changes in corporate strategies, and corporate consolidation, Jim decided to venture into a new direction. Relying on his finance degree and the skills he learned from corporate America, Jim threw his hat into the financial investment and wealth planning arena. He opened his own practice in November, 1996, specializing in investment and insurance planning for individuals, families and small business owners in Baltimore, Washington, D.C., northern Virginia and Southern Pennsylvania. 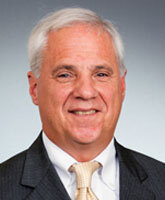 Jim is a member of the Baltimore Life Underwriters as well as the Financial Planning Association. He holds FINRA registrations and is a registered representative with LPL Financial. Jim will be pursuing his AIF designation in 2013. In 2010, Jim passed the Series 65 exam and now is able to take a more active management position with his client’s investment portfolios. Residing in Towson and married to his wife, Trish, for 43 years, Jim volunteers with the Towson Recreation Council. For 18 years Jim has watched, cheered, and coached their three children through various recreational programs and school activities. His passion is soccer and he has officiated many amateur, high school and collegiate matches throughout the area for 25 years. Now, he chases his two grandchildren. Jim is registered with and offers securities through LPL Financial/a member of FINRA and SIPC.